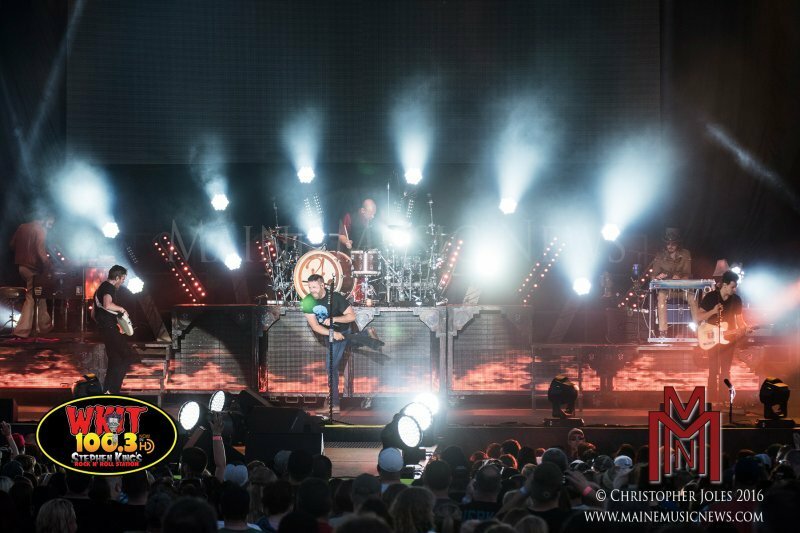 It is early June, and the Waterfront Concerts’ Machias Savings Bank Summer 2016 concert season is off and running at its Darling’s Waterfront Pavilion location right here in the heart of Bangor, Maine. 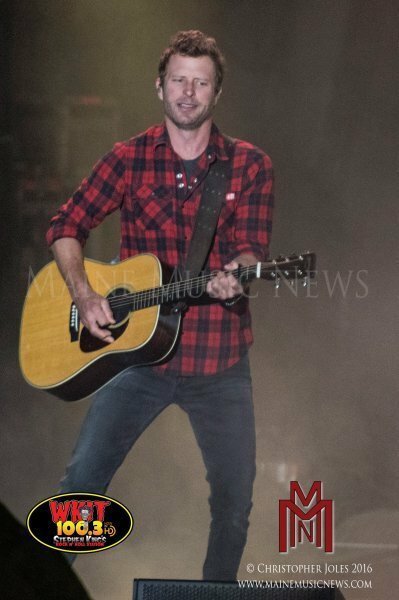 If Saturday night’s Dierks Bentley show was any indication of what’s in store for music lovers this summer then this has fun written all over it. Well, there was that good soaking shower that went through right before the music started, but what’s some smudged mascara and soggy jeans when you’re at the biggest party in Bangor on a June evening? And the tour is called Somewhere on a Beach, so the downpour and the glorious double rainbow only seemed appropriate to the spirit of the show. First, a little shout out to the Waterfront crew who have evidently been working hard upgrading the venue. Great job! 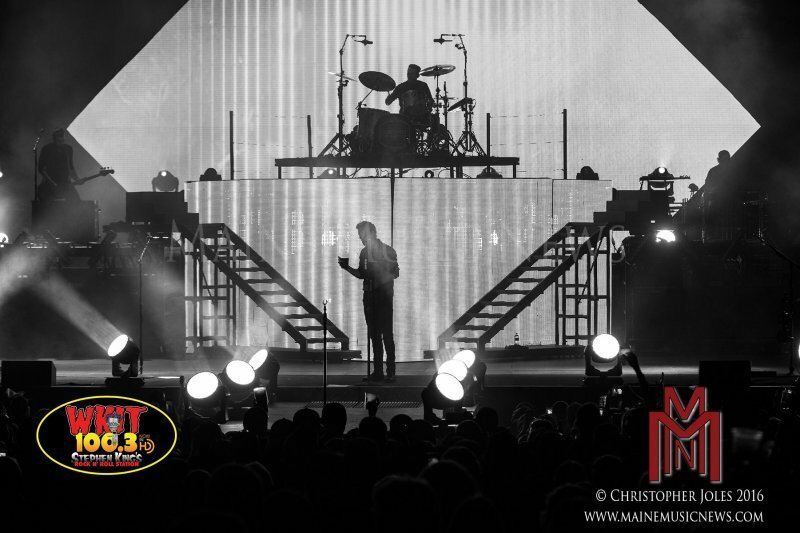 A new fence, a decked out VIP lounge, and much more, including the edition of brand new video screens studding the sides of the stage for everyone’s viewing pleasure. What more can we ask for? Let the noise complaints start rolling in while the rest of us enjoy the shows. Turn it up! Starting out the evening with a quick set, new comer Tucker Beathard fired up the crowd with his edgy country sound. 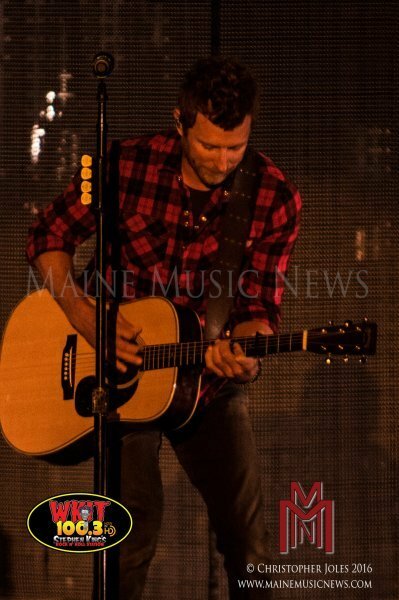 This young man is short on “skinny jeans country” and long on guitar and growl and great writing. He reminded me of a young Gary Allen meets Steve Earle with a bit of Brantley Gilbert thrown in to keep everything from being too lonesome. Those are some big boots to fill, but based on his energy and songwriting blood, he’s up for the challenge. This was a fantastic set. 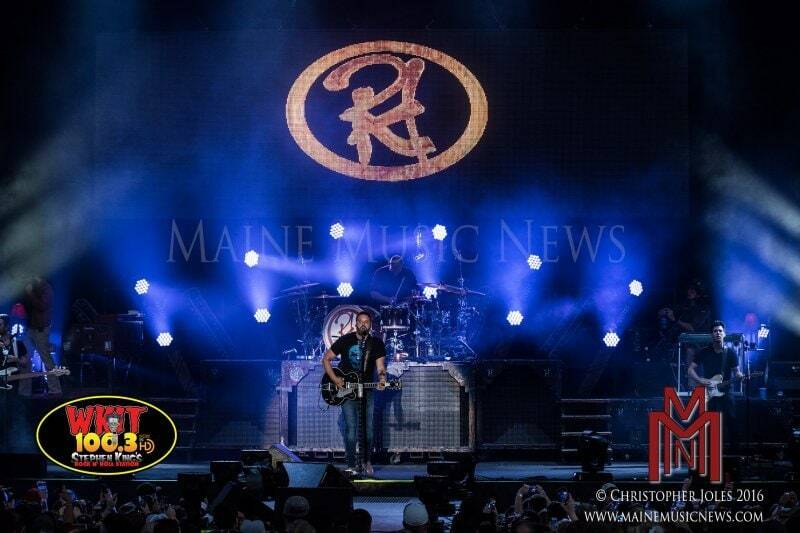 Listen for his radio single, “Rock On,” and check out more at www.tuckerbeathard.com. Keeping the show rolling, Cam was up next. She was in Bangor just recently, opening for Brad Paisley, and gave fans another wonderful performance on the Waterfront. I have to say that she is adorable with her blond curls and tennis shoes, but Cam isn’t just cute. She’s sassy and funny and backs it all up with tremendous vocals, gutsy, articulate lyrics, and a genuine connection to the crowd. She is a joy to watch perform. Her setlist offered up a nice variety of fan favorite tunes, including “Half Broke Heart,” “Country Ain’t Never Been Pretty,” and newest single, “May Day.” Tune in to see more of her at the CMT awards this week! This young woman is the real deal. Third in line for the evening – Randy Houser. Big Sound. Big Music. Big Voice. Big Stage Show. 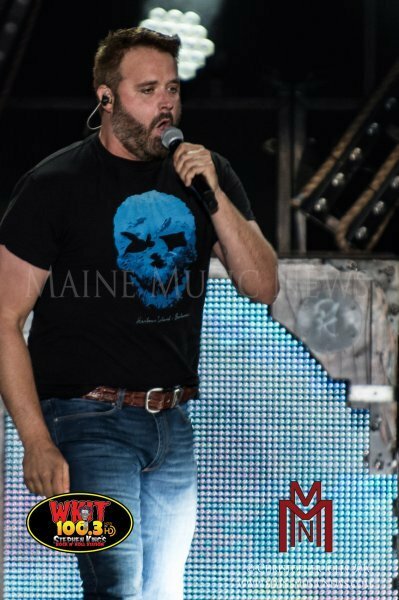 If you don’t have fun watching Randy Houser, you just might be dead. Houser’s songs express how we all want to feel – alive, free, in love, breaking loose – and he wraps it in driving guitars and hooks. 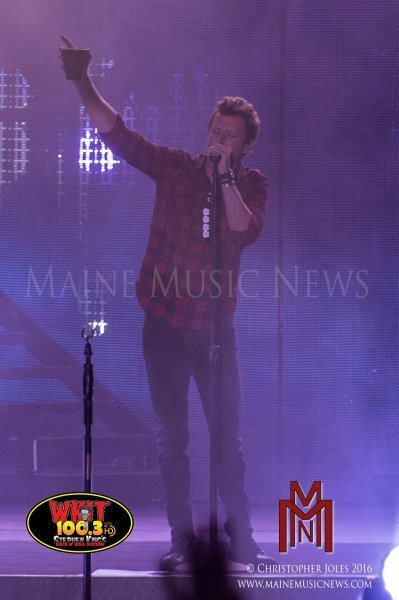 He brings a rock show to the country stage and gives it everything he has. This is jaw dropping stuff, folks. Since putting his mark on country music with his rough and rowdy hit, “Boots On,” Houser’s look has been a bit domesticated, but that hasn’t slowed down his drive and energy or the power in his vocals. Starting the night with the “We Went” video, accompanied by the mind-bending “Whole Lotta Folsom” from The Surreal McCoys, Houser ran through his hits, now a pretty deep list, including “How Country Feels” and “Running Out of Midnight.” Notable and worth the price of admission: Houser’s acoustic rendition of “Like a Cowboy.” Accompanied word for word by a few thousand fans, Houser’s voice rang out over the Penobscot River. Amazing. 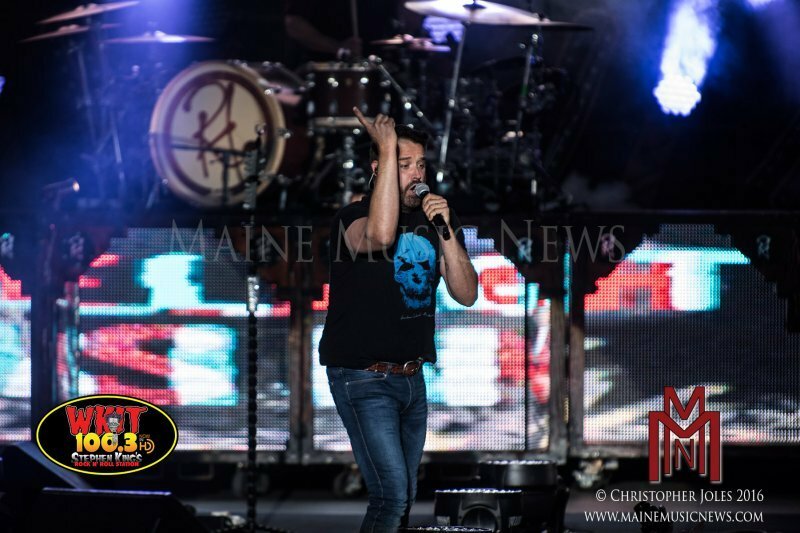 Houser came through Bangor’s Waterfront at another Brad Paisley performance, and he’s a must-see artist if you are a fan of country music. Good clean fun and country music was had by all!